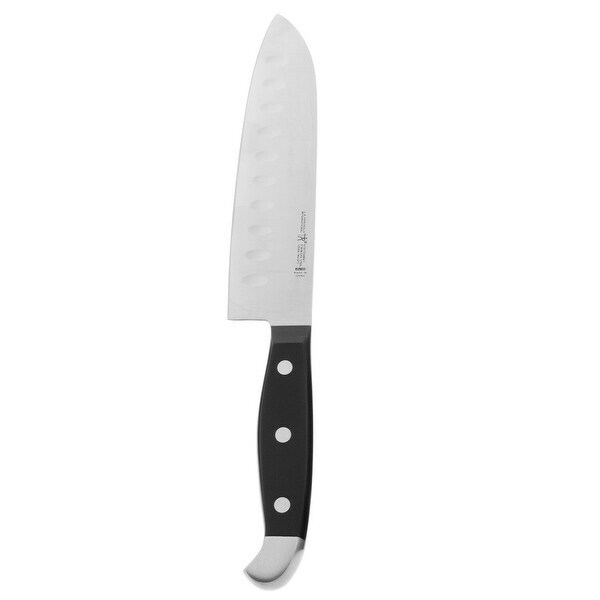 The Henckels International Statement Hollow Edge Santoku Knife is perfect for detailed kitchen tasks. Honed for long-lasting sharpness, the fine-edge blade boasts precision cutting. Santoku - Japanese for "three virtues" - excels at three cutting techniques: expertly mince garlic, slice cucumber, and dice onions with this Asian all-rounder, whose hollow edge blade has small indentations, aka grantons, which prevent food from sticking while cutting. Be careful this is very sharp! This is exactly what I needed. This is a very high quality knife at a great price. I will be ordering another one. I love the JA Henckels knives. They are very sharp and have a nice size handle without being too heavy. I was very disappointed with this purchase. The steel used for the blade is low on the hardness scale and it does not appear to hold an edge. We tried it with our Thanksgiving turkey and it did not work. My wife tried to cut lemons today after I had sharpened it and it did not cut them. Today I ordered her a much more expensive knife made in Germany with very high quality steel. I guess you get what you pay for. Sharp. Comfortable in my hand. Good knife. It was a welcome addition to my collection of kitchen knives. It was exactly what I was expecting, and I would recommend this product to a friend. These are the best knives.High quality. Bought as a gift because I love this brand. This is a great knife at its price point. The knife is very sharp and seems to hold its edge very well thus far. The only reason I gave it four stars is because there was some light scuffing on the blade when I received it.